Unlike many towns in Galicia, the ruins and poorly maintained properties that literally sit next to architectural treasures are absent in Cambados. This town seems almost devoid of a truly ugly building. In fact it is pretty much a text book Galician town where everything seems to be in its correct place and the main street (and bodega lined courtyard at its entrance) are just about aesthetically perfect. 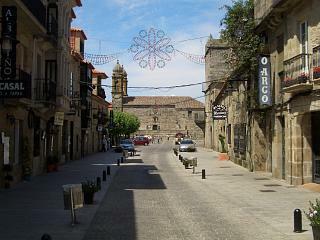 A lot of this has to do with the prosperity of Cambados and that in turn is due to its reputation as the center for Albarino wine. We followed the Calle Real leading away from the main square and into the rest of the town and noted some interconnected tourist cars pulled by a little train that form part of a guided tour – no doubt connected to the bodega, wine production and the other high spots of Cambados. This street is clearly the center of tourist activity, at least in terms of eating and drinking and all of its buildings were beautiful. Looking down the various secondary streets leading from the Calle Real we saw a traditional outdoor water bath used to wash clothing and known as a lavadero. Its real function appeared long past, but it was restored and obviously formed a part of the towns visible heritage. Numerous little bars and wine merchants also lined the winding streets leading down to the bay below. Some of these wine merchants do speak a little English and all are keen to sell Albarino from the bodegas that they source from. At the far end of Cambados another church stands in an elevated position with firstly steps and then a sloping street taking you down to the bay. Old and medieval looking buildings continue to line the narrow streets which are periodically punctuated by tiny plazas until the bay front is reached. Left, a quaint little church at the top of some stone steps. There is no beach in the town itself, but rather a coastal wall with a marina to one end and a long corridor shrouded with palm trees running some hundred or so metres in length at the other. A former prazo, now a state run parador can also be found in this part of the town and visitors are free to walk around it. This pazo also hosts the awards ceremony for the Albarino wine fiesta. You can find out more about this event by clicking on the button in the right hand menu. By taking a different path from the sea front to the main square you meander up one or more winding alleys with the occasional bar and wine store. There is also a museum of the wine route plotting the history of the Albarino wine that the area is so famous for. If you are unfamiliar with this wine, it is definately worth a try and over the last decade or so it has received international acclaim for its flavours and quality - there is even a wine route that you can travel on. 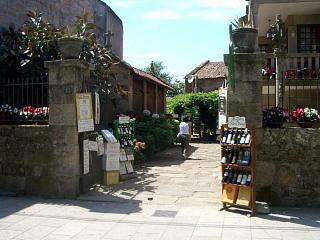 Right, the town is full of merchants and outlets selling the wines for which the area is famous. Many offer special deals on three different bottles, often proving a combination of budget, medium and higher quality Albarinos in a single box. In total we usually spend two to three hours in Cambados and we would happily stay there for much longer. The first time that we visited this town (many years ago) we were travelling to Pontevedra to meet a friend and on our arrival he treated us to one of the provinces best Albarinos. In terms of eating recommendations, you should be safe with most of the restaurants in Cambados. The town has a good reputation for quality at a fair price and the lunch time menus are usually very good. We do not generally do recommendations for bar and restaurants unless we have visited them, however there is a bar – cafe in Cambados called "Lume de Lena" offering Regional Wines, Montaditos, Good Coffee, and local Galician Beer – at least that is what its owner J.Arevalo has told me in an email. It is run by he and his wife. If you try them out please email me with your thoughts. The other restaurants that I would definately recommend, having eaten there many times, is "Luis". 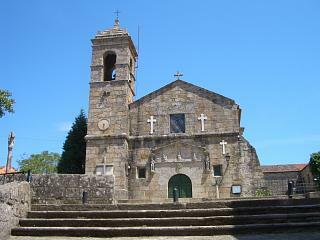 You will see it on the left as you walk past the big fortified pazo at the entrance to the town.